What are unique opportunities for graduate students in SciRes? 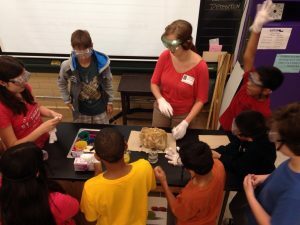 SciRes provides hands-on experience with inspiring the next generation of scientists. For master’s and doctoral students already supported on an RA or TA, SciRes offers a minimal time commitment experience (3 hrs/ week) and an additional stipend. Participants are provided with innovative training, including a graduate seminar on Science Communication led by professors Bob Duke and Jay Banner. Click the picture to see the graduate student in action! “I absolutely LOVED working with my teacher! Thanks for a great semester, I had so much fun!” Christine Bonthius, third-year Ph.D. student in the Department of Geography & the Environment. Applications for 2019-2020 are open!! Click here to apply! If you have questions concerning the Scientist in Residence program please contact the coordinator.